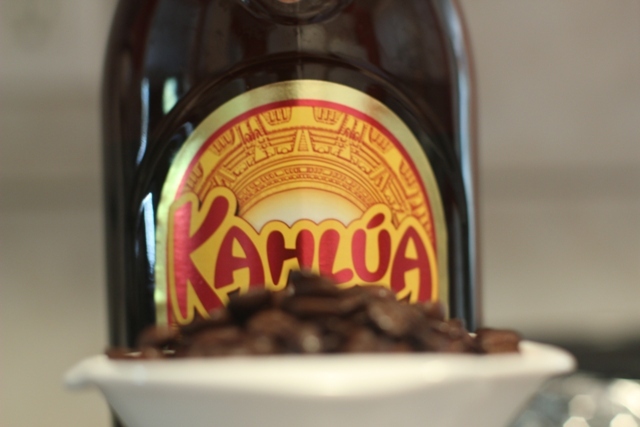 Ok, maybe not Kahlua in hand literally… maybe in the cake , maybe outside the cake… but it is there, OK? 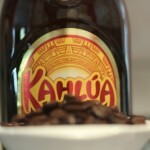 I know lately my desserts have been including Kahlua more and more. I am not the spokeswoman of that company or anything, but it would be pretty sweet if I get an offer from them (Universe, please transmit the vibe to the necessary departments!). It became a staple in my pantry, because my kitchen is very small, practically everything is within a foot of the pantry, and it is sitting close to diced tomato cans. So it is just a matter of time before I serve spaghetti with meatballs with a dash of Kahlua in them! So far, I have been really good at containing it in desserts only, although it sometimes magically shows up in my milk glass before the bed. Very strange. Anyway, back to tomorrow’s cake walk. When my coworkers asked me to bake something for our company’s cake walk fundraiser, I had never heard of such a thing. I seriously thought we were going to march with cake in our hands. I was not sure what to expect. Or maybe, I thought, we would be showing off the cakes to some kinda audience and have them bid on cakes or chase us to get the cakes! Well, I was wrong – although chasing and running around while balancing the cakes would be fun! People will decide which cake they want to compete for, then sit in a circle I think. Music will start and they will move, as soon as music ends, whoever is next to the cake, gets the cake. Or something in similar context will happen! Not sure. I’ll let them figure it out. I am just a cake supplier, nothing more! There will be a $2 charge per person per cake walk, so the more enticing the cake is, the more participants will enter. And the more pushing, pulling, running over will take place as people try to get close to the cake. Will be fun to watch a bunch of engineers to fight for a cake. I have been involved with a lot of fundraising events for the past four years due to my volunteer activities with Water for People and others at work. Somehow, you can never go wrong with a fundraiser which involves food. As soon as we brainstorm for any fundraiser, there is always a bake sale, dinners, wine-cheese parties, you name it!, we do it, people attend and don’t mind spending money. It is always easier for people to donate when there is food. And it is easier to come up with food-related activities. Must be the basic human nature. We have to eat, we love to eat…and it is better if we are actually helping somebody by eating! Win-win! Here are some tips I normally follow, unless of course I am having a clumsy day like today. 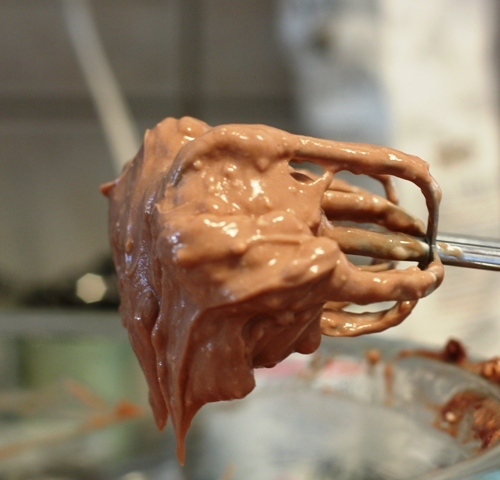 Beating the batter: Over beating is one of the most common mistakes. I soften the cream cheese, then add sugar and mix well with mixer first. If it proves to be difficult, I continue with a fork, try not to leave any clump of cream cheese. You would want to avoid over beating after you add eggs. They tend to trap air which causes cracking of the surface while baking. Try to integrate the eggs one by one with a mixing spatula. Water bath: This is essential for baking. Use a roasting pan or a baking pan that is bigger than your springform pan that you use for the cheesecake. Fill with water half way. A humid oven environment prevents cracking the surface. Wrap the bottom of your springform pan with the foil to prevent the batter from leaking or water from coming into the pan. Baking temperature and duration: This is where I went wrong today, due to a simple lazy act. The recipe I use calls for 450 degrees for the first ten minutes, then reducing the temperature down to 250 degrees for another 60 min. The cheesecake should still be wobbly in the center. Well…my recipe card was stuck under the mess in the kitchen, instead of pulling it out and looking at the recipe, I told to myself “it was 350-right? I don’t need to look for the card right now!”. So cooked it at 350 instead of 250 for an hour. Some sources say the maximum temperature for a cheesecake should be only 325 degrees, with only 45 min baking time. When mine came out, it was definitely not wobbly in the center. And, you are supposed to keep the oven door closed even after you turn the oven off. Sudden temperature changes can cause cracks as well. It should cool for another hour in the oven with the door closed. No matter how tempting it is to open the door and take a look at it, try to leave it alone! But I did not, of course! I pulled it out of the oven right away, because I realized my mistake of 350 degrees on the 59th minute of the baking time. There was no cracks on the surface when I pulled it out of the oven. I smiled and congratulated myself! Hah!! What a fool! 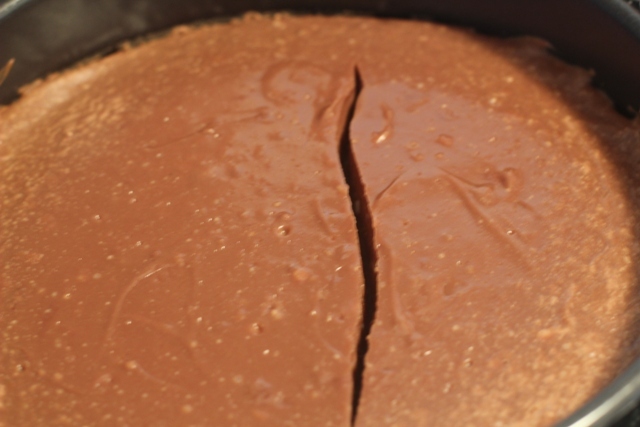 I ran a knife along the edge to separate the cake from the pan since that helps to prevent cracks as well. And within 5 minutes, a crack developed and got bigger and bigger while I was screaming “No!No!No!No!No!No!”. Even my dog, Tarchin made his way to the kitchen door from his bed where he had been napping for two hours to see what was happening since this seemed to be the highlight of his lazy Sunday as well! The bottom line is that nobody is perfect! If you get cracks on the surface, just load it up with chocolate sauce, fruit or whipped cream… When you cut the cheesecake, your guests will see the topping oozing inside, filling the cracks. Just look at them smiling and say “How rich and great, isn’t it?”. I have been using a cheesecake recipe by Elaine on Allrecipes.com for the past 8 years. 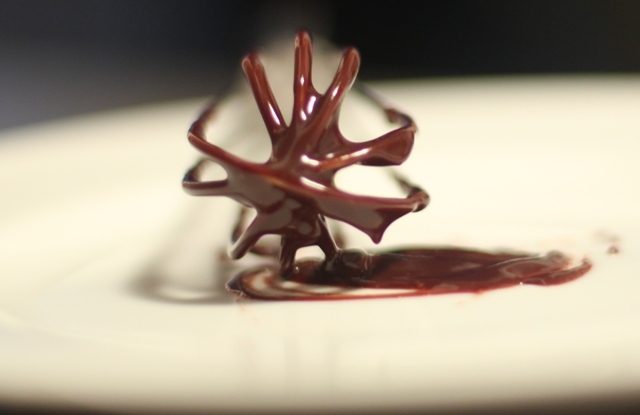 This time I used Kahlua instead of Irish Cream liqueur, and added chocolate ganache topping. May your batter be smooth and may your cheesecake be crack-free! Chocolate ganache: 125 gr of semi sweet chocolate chips melted in 4 tablespoons of heavy cream and 1 tablespooon of Kahlua, then whisked to the desired consistency to spread over the cake. 1. Combine the first four ingredients well and then pat it into the bottom of a 9-inch springform pan lined with parchment paper. Bake it in preheated 350-degree oven. (10 minutes). 2. 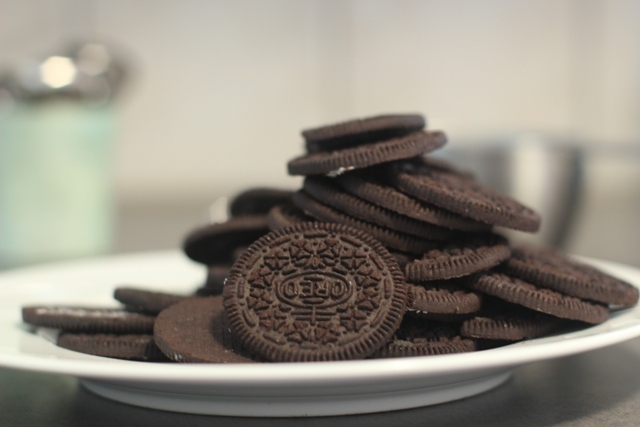 In a bowl, mix softened cream cheese, and the next three ingredients. You can use a mixer in this step. However, if cream cheese is not soft enough, you might have a little bit hard time with the mixer. If so, continue mixing with a fork until everything is well blended. 3. With the help of a mixing spatula, integrate the eggs to the mix, one at a time. Add sour cream and Kahlua and stir until everything is well blended. 4. 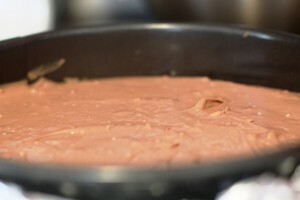 Pour the batter into the pan and cook at 450-degree F for 10 min, then at 250-degrees for 60 min. After the cooking time is over, turn off the oven and let the cheesecake cool for another hour in the oven without opening the door. 5. 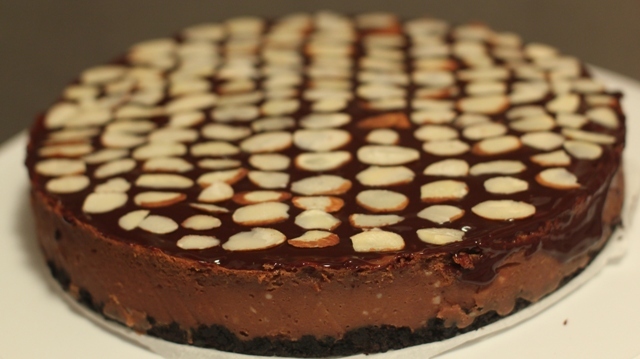 After the cake cools down completely, make the chocolate topping and spread it over the cheesecake. This cheesecake looks great! As long as they don’t ever see the crack, it will be perfect in everyone else’s eyes! And I’m sure it’ll taste amazing!